Love them or hate them Team Sky wins races. And that means the equipment they are riding tends to find itself on the top of the podium. And that winning streak of Sky equipment is not just limited to UCI legal road cycling. Look no further than Cameron Wurf riding a Pinarello Bolide to the fastest bike split at Kona ever. 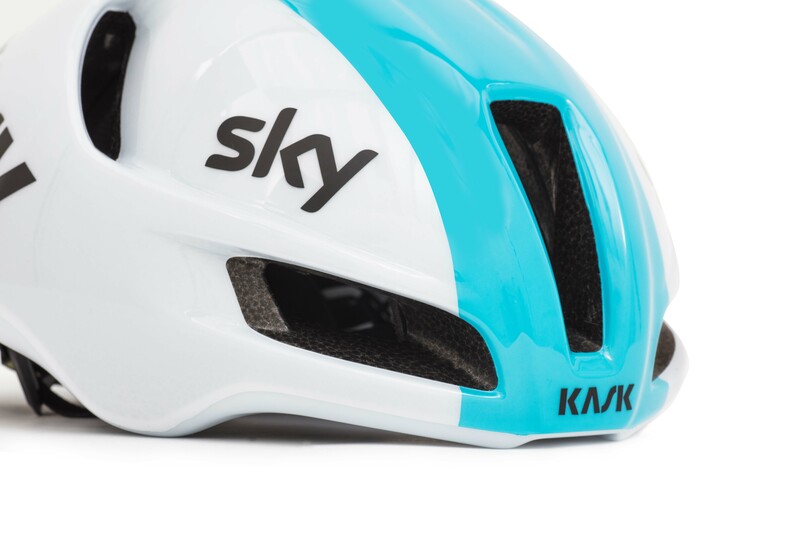 So, when Kask announces their most aerodynamic road helmet ever. You probably want to pay attention. To develop the Utopia, KASK tested 10 of the best road aero helmets on the market in the wind tunnel, and created a 3D scan for a computational fluid dynamics (CFD) simulation. The helmets were tested at various speeds and yaw angles to reflect cross winds. At the end of the test, the drag data of Utopia versus the best competitor helmet resulted in a saving of up to 6 watts when riding at 50kph. While aerodynamics is key, ventilation was not forgotten. Suitable for road racing and triathlon, Utopia was designed to be used year-round in all climates. Utopia uses a breathable and quick-dry padding, offering a 5mm layer of fast-wicking material called Resistex that takes moisture away from the rider’s head and moves it to the helmet’s outer shell, contributing to a helmet that’s comfortable to wear all day. The vents are designed to improve aerodynamics and cooling. 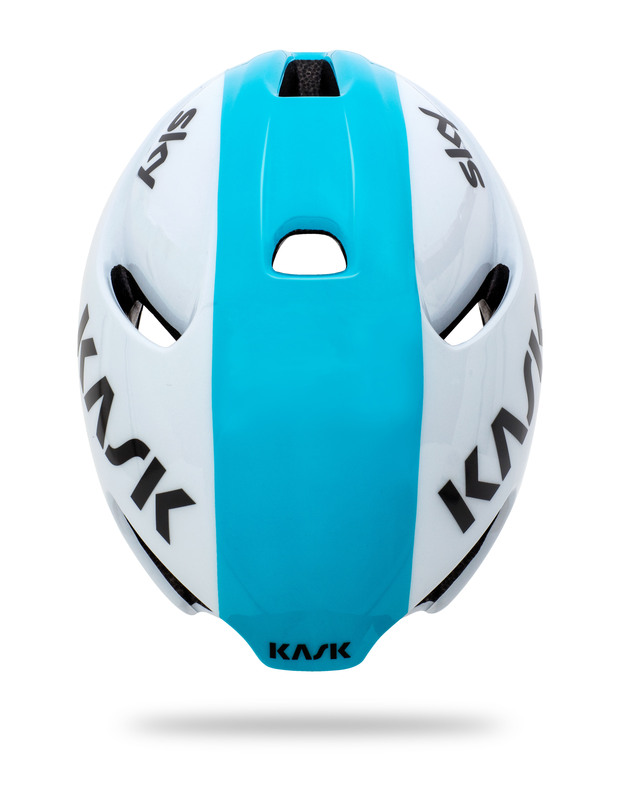 While internal channeling has been designed to push the aerodynamic capcity of the Utopia as far as Kask could. The Utopia provides a quiet riding experience thanks to the reduced wind rush close to riders’ ears. Resistex Carbon is a yarn with unique technical characteristics involving a continuous filament of conductive material based on active carbon. The fibers are both bacteriostatic (respects the skin and protects from bacteria and polluting allergies) and heat regulating (fibers speed up the evaporation of perspiration and help maintain a constant temperature). To keep you comfortable the Utopia uses Kask’s easily adjustable Octo Fit adjustment system. Utopia will be available in three sizes (S – 50-56, M – 57-58, L – 59-62). With the medium weighing in at 235g. Pricing hasn’t been provided as of yet (but keep an eye tuned here for the details when we get it). 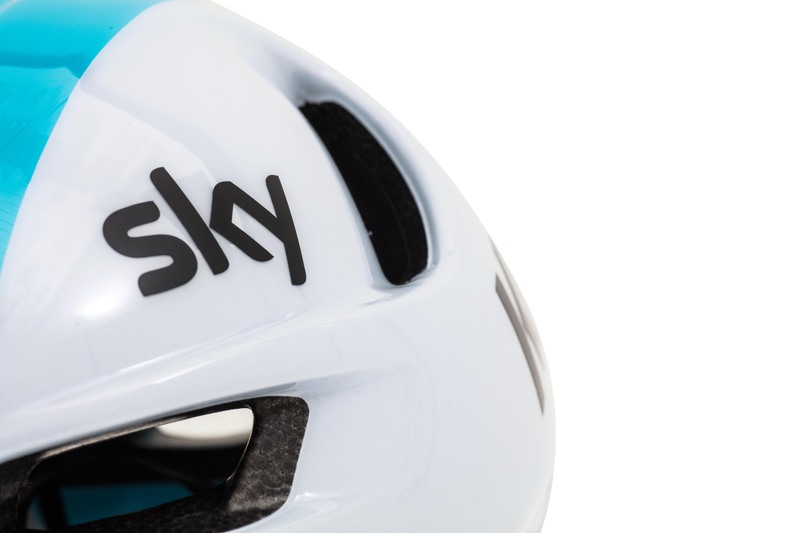 Team Sky will first race using Utopia in the Santos Tour Down Under, according to the stage profiles, and will wear them in white to match the team’s new look for 2018. If it’s good enough for Sky then we are going to pay attention. Without full aero details and a real breakdown on how it was developed (plus some saddle time) we are going to withhold final judgement. But we are definitely excited to get our hands on one and ride with it for ourselves. Make sure to stay tuned to AeroGeeks.com for the latest details on the Utopia and all the new gear that will be showing up on the World Tour.